In conversation with Chee Pearlman, Karin Hibma and Michael Cronan discuss how they helped to change the focus of the Aspen Design Summit to serve the needs of disigners today while continuing to respect the Aspen legacy. "From the recent AIGA Aspen thinktank session, I have many good memories. 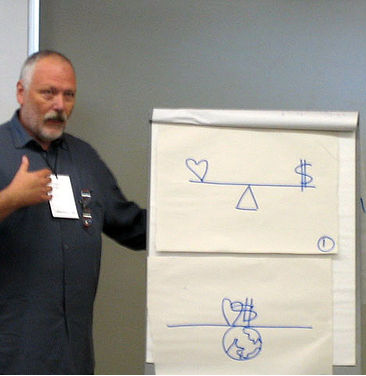 One in particular is the diagram drawn by the team that included Michael Cronan shown here on the right. Our team was given the topic of discourse while Michael's team was given the topic of money."